MONTHLY CONTACT LENSES AIR OPTIX COLORS CREATE AN INTENSE LOOK EVERY MONTH! 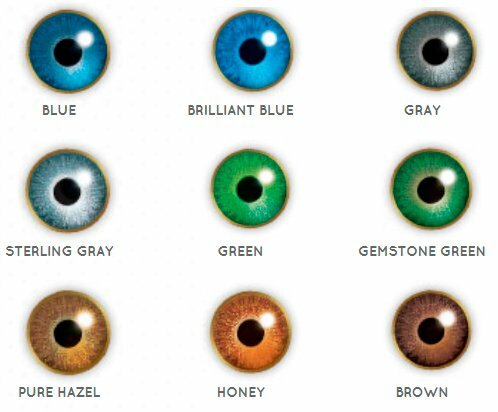 Available colors: Brilliant Blue, Blue, Gray, Steel Gray, Gem Green, Green, Intense Amber, Honey, Brown. Format: 2 units per box. The monthly Air Optix Colors lenses are manufactured by the prestigious Alcon laboratory, with the most advanced technology in contact lenses of color , creating a beautiful look in a natural way. Manufactured in Silicone Hydrogel, these lenses transmit to the eye a large amount of oxygen during use, favoring eye health and keeping the eye very white and healthy. An outer ring that creates a definition ring, that is, defines the eye. The primary color, which transforms the color of your eyes. An inner ring that clarifies and adds depth to your look. Beauty: Thanks to its exclusive 3 in 1 technology that enhances any eye color, resulting in a natural and beautiful look. Comfort: In its manufacture, SmartShield technology is applied, preventing tear deposits from adhering to the surface of the contact lens, making its use more comfortable, throughout the month of life of the lenses. Oxygenation: Due to its manufacture in silicone hydrogel, the transmission of oxygen molecules to the eye is very high, providing health to your eyes and giving them a very white appearance. 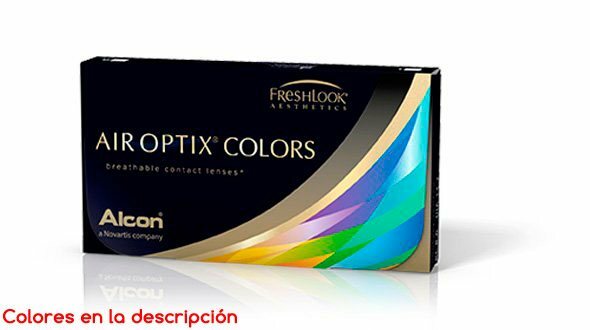 When ordering your Air Optix Colors monthly contact lenses in PRODEVISIÓN, it is necessary that they have been prescribed by an Optical Vision specialist or Ophthalmologist, from there, you must place your order by copying the parameters of the last box you have acquired, that is, the first adaptation has to be done by the professional who will assess vision, movement of the contact lenses in the eye and also teach you the correct handling and maintenance of these contact lenses. It is important to mention the maintenance fluid, usually called a single solution. This must be of quality (first mark, all liquids are not equal) and if possible always use the same, a change of liquid can cause serious problems in the use of these contact lenses. At PRODEVISIÓN we have the first and best brands of maintenance liquids on the market that assure you that they will take care of your eyes and your Air Optix Colors lenses with all the guarantees. It is essential to follow all the indications of use of the manufacturer of monthly contact lenses (Alcon) in terms of hours of use, care, handling and replacement. If you notice discomfort when wearing them, red eyes or do not see correctly, take them off immediately, discard them and consult your optician or trusted ophthalmologist. Otherwise, you may have eye problems.